Spider vein removal at About Face Brisbane is fast, safe and extremely effective. Our advanced spider vein laser treatment will erase those annoying spider veins on your legs or body and give you back the confidence to wear that mini skirt! We also offer facial spider vein removal treatment which is very popular and so much more convenient than spending time and effort masking facial veins with makeup every day. This page will give you all the information you need about spider veins, including what they are, how they form, and how About Face Brisbane can banish them safely and quickly. If you need treatment for varicose veins, you can visit our varicose veins treatment page to get the facts on the best way to get rid of varicose veins. Spider vein removal – what are those annoying spider veins? 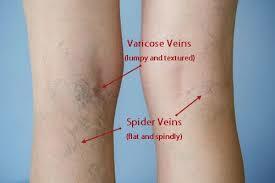 Spider vein removal is best understood by first knowing what spider veins really are. Spider veins, a type of vascular lesion, are abnormal veins that are like varicose veins but occur closer to the skin’s surface and smaller in size and appearance. They are usually blue/red and appear most commonly on the face or legs. Spider veins look like branches of a tree or spiders’ webs and can cover a large or small area of skin. Spider vein removal – what causes spider veins? Veins transport deoxygenated blood back to the heart. In the legs, the superficial veins (veins just below the skin’s surface) collect blood which is then delivered to other, deeper veins within the calf muscle. The normal functioning of the calf muscle helps to pump blood back to the heart, against the force of gravity. Valves inside the veins stop the blood from travelling back down the leg. However, if the valves become weak and can’t close properly, blood collects in the superficial veins. As time goes by, these veins become ‘varicose’ – they distend (swell) with blood. Varicose veins are characterised by a twisted, knobbly and bluish-purple appearance, and can be painful. For more information on varicose veins plus how About Face Brisbane can get rid of them, visit our varicose veins treatment page. vein inflammation, called phlebitis, caused by clotted blood in the vein. Spider veins are usually blue or red, and sometimes have an appearance similar to a tree branch or spider web – this is why their common name is spider veins. The most common places they occur on the body are the face and legs. Spider veins may affect a large or small area of skin. How can About Face Brisbane get rid of my spider veins? About Face Brisbane uses the latest and most effective spider vein removal technique: spider vein laser treatment. Dr Colin Campey, our head doctor, has been performing spider vein laser treatments for more than fifteen years with a flawless safety record and an excellent success rate. The laser energy from our Dynamis Long Pulse Nd:YAG or Diolite KTP laser is absorbed by the pigment in the blood (oxyhemoglobin) contained within the spider veins. As the energy is absorbed, the area of skin above and around the spider veins will become temporarily white in colour. After a few minutes, the spider veins won’t be visible anymore, which indicates the desired effect has been achieved. This makes the process very controlled and safe. Selective Photothermolysis is the name of the method used for spider vein removal. This process is the conversion of light energy to heat energy, with the heat affecting the target spider veins but not damaging the tissue surrounding them. This selective heating up of the spider veins causes them to disintegrate and shrink, allowing them to be absorbed safely into the body. The diagram on the left shows how the treatment works. Birthmarks can also be treated in the same way. What the spider vein removal process? You’ll have an initial consultation (cost is $50 with a $38 rebate from Medicare) with Dr Campey, who will look at your spider veins and explain how laser spider vein removal works, the number of treatments you’ll require. After the consultation, you can either go ahead with the treatment right away or book in for another time. For the treatment, you’ll lie on your back on a comfortable table in a private room in our North Lakes clinic with your legs elevated slightly. Dr Campey will perform the treatment by passing the laser beam over the affected spider veins. There is no recovery period needed after spider vein laser treatment. You walk in right before this treatment and walk straight out the door after it finishes – it’s as easy as that. On the odd occasion, some patients experience a mild scabbing of the treated area which is transient. The skin on the treated area can be a little red and irritated or there may be no adverse reaction to the treatment at all. Because everyone is different and their body responds differently the after affects vary from person to person. Dr Campey will explain everything to you in detail at your initial consultation. How much do laser spider vein treatments cost? One session costs between $200 to $350 depending on the area size being treated. You can also take advantage of zipPay for this treatment which means you can enjoy saying goodbye to those annoying spider veins now, but pay later. Please be aware that can accept zipPay, however not zipMoney are these are different payment methods. Spider veins will not go away by themselves, so call or email us today to book an appointment or find out more information about laser spider vein treatment. How many treatments will I need to get rid of my spider veins? The number of treatments required will vary from person to person. This can range from 1 to 3 sessions. What other vascular lesions besides spider veins can you treat with laser? Veins of all sizes, except most varicose veins (sclerotherapy is usually the best option to remove varicose veins). Broken capillaries, including on the face. Vascular birthmarks (port wine stains). Does spider vein laser treatments hurt? The treatment is not painful, but you may feel a little heat sensation in areas. Again, this is very much an individual response as everyone has different pain thresholds. We do everything to make sure your treatment is comfortable for you. Can laser be used to get rid of varicose veins? In some cases, About Face Brisbane can treat varicose veins with laser therapy, but Dr Campey would need to take a look at your veins during a free consultation to confirm this. Most of the time, sclerotherapy is the best option for varicose veins. How can I prevent spider veins from forming? Wearing support (compression) stockings (medical grade). Minimising the amount of time you spend wearing high heels. Exercising regularly to improve blood circulation. The best way to tackle your spider veins is to have them treated in our clinic. You can reach our friendly staff today on (07) 3482 2999 or email us at info@aboutfacebrisbane.com.au.